The Scorpio Races is one of those books that you can read as much as you want about and raise your expectations to seemingly unreachable levels, but nothing can prepare you for the story within its pages. It’s beautiful – from the writing, to the descriptions, to the characters and their relationships – everything about this novel is a beauty. Yet, what truly moved me as I read this novel was the sheer amount of passion it contained. I have never read a Maggie Stiefvater novel before, but if each one of her stories is like this, then I can definitely see the appeal. If anything, it feels as if Stiefvater poured her heart out into this novel; as if it was waiting, dark, secret, and hidden in her soul, just waiting to be spilled onto paper. It isn’t often that I can say that I truly felt immersed in a novel, but I most certainly did with this story. In fact, when I finished it I could only blink in silence, not only at its brilliance, but to remind myself that I wasn’t on a magical island, standing barefoot on the beach; I was merely a reader having read a remarkable novel. It was then that I knew that The Scorpio Races was a novel that would stick with me…for a long time. 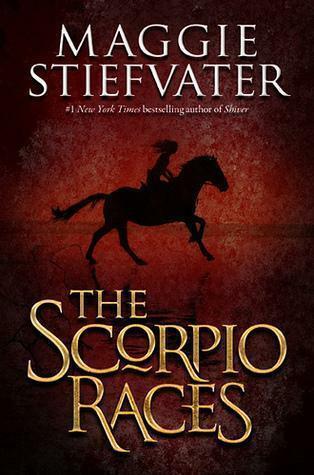 While Stiefvater’s novel is titled The Scorpio Races, in reality the race itself takes up very little of the plot. Thus, it seems like an insult to this novel to give you any type of plot summary of it as nothing will do it justice. I could tell you that The Scorpio Races is told from the dual narration of Puck Connolloy and Sean Kendricks, both of whom are competing in Scorpio Races held every November on the island of Thisby. I could also tell you that this isn’t just any horse race, it is one with the capaill uisce, deadly seahorses that thirst for flesh and blood. I could further go on to tell you that Sean is a four-time winner of this dangerous competition which takes peoples’ lives and Puck is the first girl to ever enter; that Sean has been promised ownership of Corr, the capaill uisce who is his friend, brother, and family; that if Puck wins her family will not be evicted; I could tell you all of this, but I won’t because it isn’t important. In reality, The Scorpio Races is a novel about love, passion, and friendship and those are far more important, compelling, and heart-warming than any horserace could ever be. I have to admit, I didn’t expect to love this book as much as I did. In fact, ever since I heard Stiefvater’s Shiver Series described as Twilight for Team Jacob fans, I have studiously avoiding her writing until very recently when the glowing reviews of The Raven Boys began to trickle in. Yet, Stiefvater is a truly phenomenal author, one whose writing is extremely descriptive, detailed, and atmospheric. Not only did I truly feel as if I were in Thisby, caught up in the excitement leading up the Scorpio Races myself, I felt as if I was Puck and Sean too as their feelings and emotions were so tangible, even to me as the reader. While The Scorpio Races is a novel about many things, including the stories of Puck and Sean, it is primarily a story about seahorses. In fact, even the land, Thisby, is a character in itself for it is a land with people who are vastly different from everyone else, whose trademark is their Scorpio Races, and it is a land that beckons to these dangerous creatures from far away. Yet, for all its beauty, the island of Thisby isn’t my favorite character – it’s Sean Kendrick. Sean isn’t your typical, run-of-the-mill swoon-worthy guy, but boy did I swooooon! I think what really made me fall for Sean was his passion for horses. It is evident that he has a way with these magnificent creatures and the entire island respects him for his ability to knock sense into and break, not only horses but even the capaill uisce. Yet, Sean only truly cares for one horse – Corr. I still don’t know how Stiefvater did it, but she developed the friendship between Sean and Corr perfectly. In fact, when I think of them, I don’t think of them as man and beast, I think of them as one being as they understand each other perfectly and are nothing without each other. If I’m being honest, I might as well admit that the strength of their bond, their deep-rooted trust of one another, and overall relationship was so heart-warming that I often found myself tearing up ever-so-slightly as the novel progressed. While Sean completely steals the show, in my opinion at least, with his rare smiles and portrayal of being a strong-but-silent type, Puck too is a brilliant character. Puck, whose actual name is Kate, is faced with a struggle to become the first woman to participate in the Scorpio Races. Although she has excellent reasons for joining, the island which she loves so dearly contains superstitions amongst other prejudices that make it difficult for her to participate. Yet, she never gives up, persevering on courageously in the face of danger, and for that, I love her and her firm conviction. In the age of Mary Sues in YA Fiction, she is truly an empowering and inspirational character for women everywhere. Yet, for all my love of Puck and Sean individually, I loved their romance as well. While they seem to be total opposites, their joint passion for the island and its horses is what brings them together and it seeps through vibrantly on every page. I loved that their romance was slow-to-build and even more butterfly-inducing as it burned, but it never detracted from the novel in the least which I appreciated. 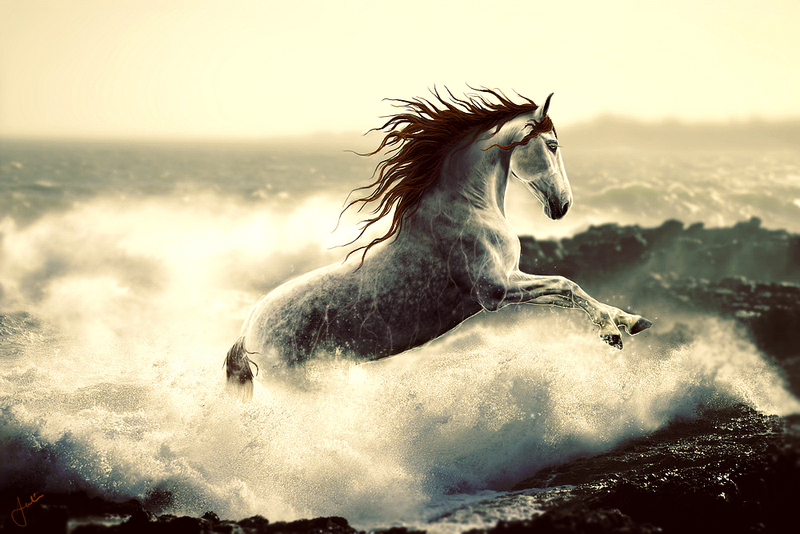 The Scorpio Races isn’t meant to be a romance – it is meant to be a story of horses, of love, of passion, of connection between man and beast, of love for a land and of its magic. It does have a slow beginning, but it is a start that perfectly sets the stage and develops these characters into wonderfully moving, tear-inducing, and realistic beings. In all honesty, there is a lot about The Scorpio Races which I haven’t said, but I don’t want to tell you – I want you to find it and read it and cherish the magic this story creates for your own. It is a novel that will make you think, reflect, appreciate, and contemplate over for nights. It is a story that is thought-provoking and heart-warming, that is deep and beautiful, and that will strike a cord within your heart. I loved the lyrical prose, the rich complexities and multi-dimensions of every character, and the way in which this tale unfolded. I don’t know what more to say about it; I just want to think over it for hours. In fact, I can say only one more thing before I leave you all to pick up a copy of this yourselves: I loved it. I don’t love a lot of books, but I loved this, and if that doesn’t compel you to pick it up, then I don’t know what will. I'm so glad you enjoyed this, hun, I thought it was a wonderful story. So happy to hear about a book you completely love!!! This is a beautiful and wonderful review!!!! Shiver is also amazing, nothing like twilight, read it since you loved this book so much. I completely like how you described the friendship between Corr and Sean. Like you Sean was my favorite character. This book might not be my favorite, but i really enjoyed reading your reasons for loving it. amazing review. you should try TWoMF . is nothing like twilight !!! it has no controling badboy but a solid relationship. i must read scorpio races soon. Oh my gosh. Your review. Just... YES. All I can do is sit here with a stupid little smile on my face, chin propped on my fist and nod dreamily in response. Because you took me back to the island of Thisby with Sean and Puck and Corr and Dove and I was lost. You really captured everything I love about this novel. I've loved all Maggie's previous novels, but I really think she outdid herself with TSR. I was in tears on the last page!! Such a beautiful way to end it <3 And a beautiful review to make me remember, thanks Keertana! I'm so happy your first Steifvater experience was an AMAZING one. Awesome review, Keertana! ♥ SO glad you enjoyed it! Excellent review and I totally agree! :) The book took me awhile to get into it, but once I was in that was it. The real world didn't exist anymore:). I'm glad you enjoyed it too! Okay, The Scorpio Races sounds exactly like a me book! I mean, sea horses AND well developed characters and worldbuilding? Be still my heart. I to picked up this book because of the amazing things I have head about Raven Boys. I to avoided the Shiver series for similar reasons. I felt the exact same way about The Scorpio Races. I adored everything about this book from the supporting characters, to the relationship built on respect between Puck and Sean and especially there love of horses. I felt like this book curled up in my heart and won't leave. I have since picked up the Shiver series and I have been enjoying it. Ignore the Twilight for Jacob fans. It is way better than that. But it is not The Scorpio Races. You can tell that The Scorpio Races was written after. The writing it of a higher caliber, especially when it feels like Maggie poured her heart and soul into the Scorpio Races. Don't get me wrong. Shiver is still very good, but where The Scorpio Races is a Solid 10/10 maybe even 11/10 Shiver is only an 8/10 for me. I eagerly await The Raven Boys and am putting The Scorpio Races on my Christmas wish list as it was read from the library. In fact The Scorpio Races is being gifted to both my Mom and my sister this year for Christmas. Maggie Stiefvater is one of the best YA writers! Her characters jump off the page and shine in this story that isn't so much about horses as human spirit. The world building is so seamless, I could have sworn I'd been to Thisby Island at some point in my life. The plot is simple, and works to highlight how spectacular Steifvater's storytelling is. I couldn't put this book down, and though I love all of Maggie's writing, this one stands out as some of her best!